It had been months since I had worked on something geometric. My head was overwhelmed with New York City and all the Mickey heads were blooming into other directions.My brain was operating in this attention deficit direction and my imagination was pointing into a million directions like an exploding octopus. At this point Disney Fine Art had established the core categories of the project, and I became focused on making some kind of headway into the other divisions. I began to shy away from the “Geometric Spectrum” part of the series because I felt in some way, that returning back to the basics would have felt defeatist in some sense. I’ve come to learn, with all projects, no matter how short the timeframe, that returning back to the basics, can somehow reset the soul and settle the brain. I thought about Neoplasticism and its core operations of being, and how simplicity isn’t necessarily simple, and how geometric work, even at its primal executions, were still beautiful and relative. I sat with this Mickey for a while, trying not to rehash the same elements of the series, and tried to push the idea of “Geometric Spectrum” further. The beauty about the elements of shapes is that they hone on the most fundamental and easily understood aspects of our surface feelings. Staring into a simple shape can evoke the most basic of emotions and for some of us, that brings the feeling of safety of recognizing how we feel about the art we see. In this piece, I created circles circling outwards, and played on light and darkness to give not just a feeling of dimension, but a feeling of depth and direction. I titled this “Vertigo, Vertigoing, Vertigone” for the shapes imbues a sense of soft confusion and warm dizziness. 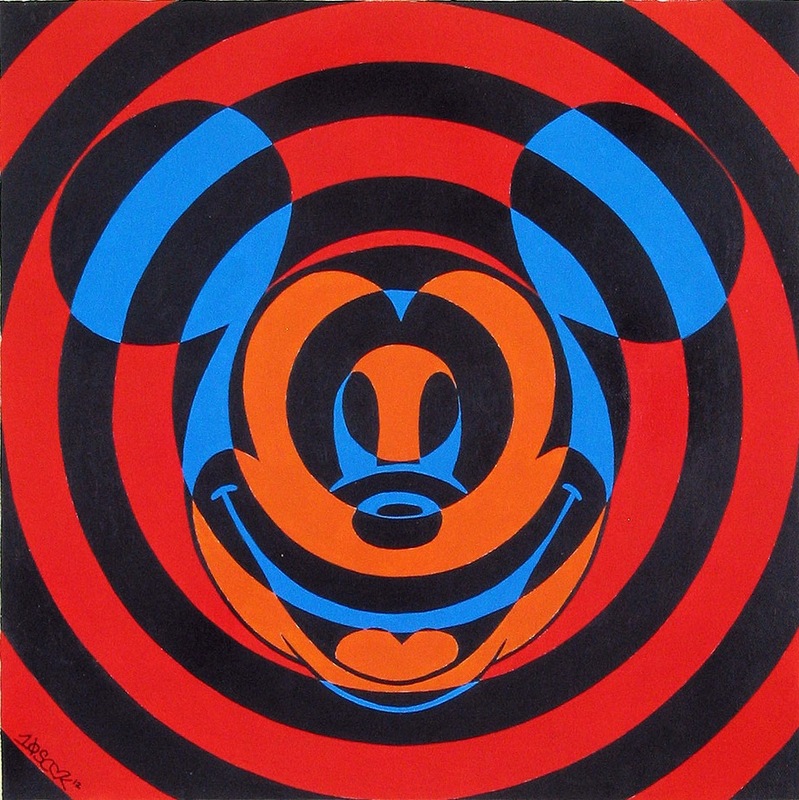 The background elements are red to emphasize a feeling of quiet madness, while Mickey radiates a light coolness, that emphasizes calmness and brings the viewer into a form of solace. This is number 46 in the series.